engineering staff at Stern Pinball, the pinball machine takes Spider-Man™, Spider-Man™ 2, Spider-Man™ 3 and puts them all into one fast-paced pinball machine that will excite both operators and homeowners alike !. on the playfield with an associated shot. Defeat all four villains and experience Battle Royale! of the playfield; and a whole lot of amazing multi-ball action. Kevin O’Connor created the backglass and playfield art, while Marc Schoenberg and Mark Galvez produced the cabinet art. The pinball machine has a phenomenal music and a sound package composed and adapted by David Thiel, along with over 800 speech calls. The dot matrix animations created by Mark Galvez are stunning and feature scenes from Spider-Man™, Spider-Man™ 2, and Spider-Man™ 3 movies. Earning very well and eminently collectable, SPIDER-MAN™ pinball from Stern is a solid and entertaining package that will rock the pinball universe. 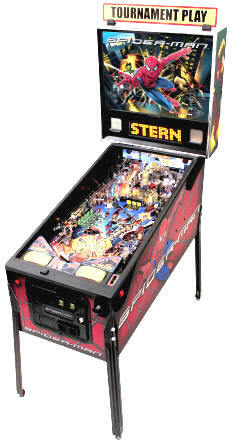 Click here for info and pricing on this and other Stern Pinball Machines ! Click here to read a "First Look" Preview of SpiderMan Pinball with more pictures ! has finally managed to strike a balance between his devotion to M.J. and his duties as a superhero. When his Spider-Man suit suddenly changes, turning jet-black and enhancing his powers, it transforms Peter as well. Under the influence of the suit, Peter becomes prideful and overconfident and he begins to neglect the ones he cares about the most. As two of the most-feared villains yet, Sandman and Venom, gather unparalleled power and a thirst for retribution, Peter’s greatest battle is the one within himself. Spider-Man will need to rediscover the compassion that makes him who he is: a hero. Columbia Pictures Presents A Marvel Studios/Laura Ziskin Production Spider-Man™ 3 starring Tobey Maguire, Kirsten Dunst, James Franco, Thomas Haden Church, Topher Grace, Bryce Dallas Howard, James Cromwell, Rosemary Harris, and J.K. Simmons. The film is directed by Sam Raimi. The screenplay is by Sam Raimi & Ivan Raimi and Alvin Sargent and the screen story by Sam Raimi & Ivan Raimi and based on the Marvel Comic Book by Stan Lee and Steve Ditko. The producers are Laura Ziskin, Avi Arad, and Grant Curtis. The executive producers are Stan Lee, Kevin Feige, and Joseph M. Caracciolo. Columbia Pictures, part of the Columbia TriStar Motion Picture Group, is a Sony Pictures Entertainment company. Sony Pictures Entertainment (SPE) is a subsidiary of Sony Corporation of America (SCA), a subsidiary of Tokyo-based Sony Corporation. SPE’s global operations encompass motion picture production and distribution; television production and distribution; digital content creation and distribution; worldwide channel investments; home entertainment acquisition and distribution; operation of studio facilities; development of new entertainment products, services and technologies; and distribution of filmed entertainment in 67 countries. Columbia Pictures' Spider-Man™ feature films and animated series all based on the Marvel character.